Want to know how you can engage your audience online? Engagement remains one of the key measurements of a digital campaign’s success. In order for engagement to happen, we need to identify both the vehicles as well as the mechanics of the campaign and pick those that will elicit the highest amount of response from your intended audience. Here are 4 ways to have more engaged audience, however, each one can be executed with a unique idea to drive it further. Crowdsourced campaigns, once thought of as a fad, could very well become the norm as we’re seeing more brands embracing this approach. Marketing start-ups Crowdtap and Ipsos believe that Millennials trust consumer-generated content more than any other media. There is a sense of authenticity that brand-generated content will find hard to manufacture. Starbucks ran a contest in the US and Canada inviting customers to decorate their white cup, snap a photo and tag Starbucks on social media. In less than a month, they received over 4,000 entries. The winning design was imprinted onto a limited edition Starbucks reusable plastic cup. The success of the contest resulted in Starbucks running a similar contest for their own employees and another during Christmas, with their red cup. There is something about special events that unite people and connect all of us together. 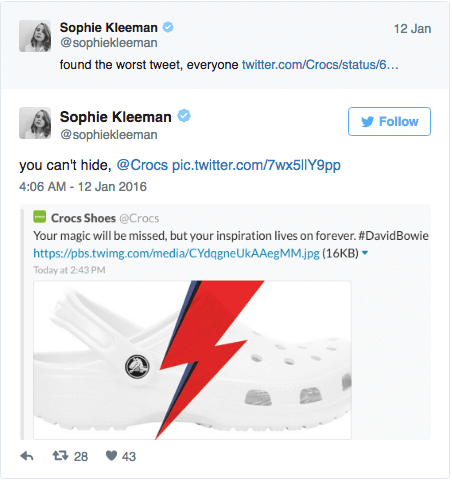 The passing of music icon David Bowie in January elicited some really clever postings by several brands, and some not so. It’s an opportunity to boost your brand, for sure, but only if it’s done tastefully. 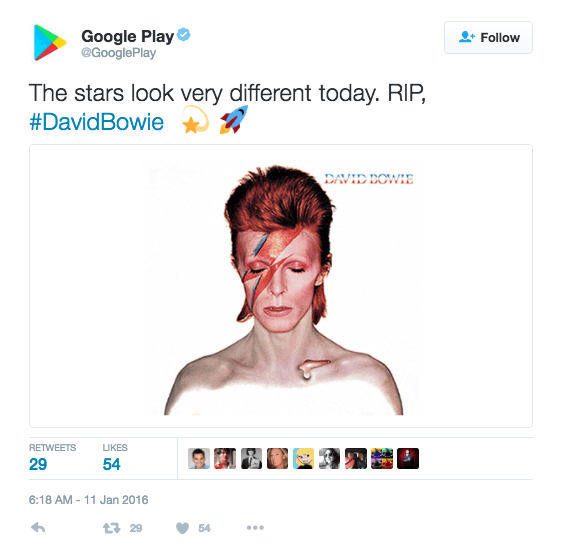 A genuine tribute done well from Google Play. Crocs received flak and had it deleted it 20 minutes after it went up. But the damage had been done. Locally, Nando’s Malaysia ‘chicky’ ads never fail to strike a chord with fans and non fans alike. Recently, a statement made by a minister on holding two jobs to cope with the rising cost of living generated much attention among netizens and was quickly picked up by Nando’s with the headline “#2kerja? Staff kami #banyakkerja dowh”. A consumer purchase journey has become increasingly complex, whereby decisions are influenced from various touch points, online and offline. From website to brick-and-mortar store, each channel is an opportunity to reach your consumers. Have an in-store treasure hunt and share the video online! Creating seamless marketing campaigns that run across the different channels not only provides the consumer with a seamless experience, it also reinforces your brand presence. What are you doing to increase your brand visibility and engagement? Share your comments with us.